يحظى فندق Chidori Court Apartments بمكان متميز في محور جولد كوست مطاعم, سياحة, شواطئ في منطقة ماين بيتش الفاتنة. إن موقع الفندق الاستراتيجي، الذي يبعد 2.5 km فقط عن مركز المدينة، يسمح للنزلاء بالوصول سريعاً وبسهولة إلى العديد من الوجهات المحلية المثيرة. كما يمكن الوصول بسهولة إلى ماين, Cheyne Horan School of Surf, 1st Wave Surfing. يقدم Chidori Court Apartments خدمات لا غبار عليها وكل أشكال اللياقة وحسن الضيافة اللازمة لإسعاد ضيوفه. يقدم هذا الفندق العديد من الخدمات الكفيلة بإرضاء أكثر الضيوف تطلباً. بالإضافة لهذا,تتضمن كل غرف الضيوف مجموعة واسعة من وسائل الراحة . بعض الغرف توفر حتى إغلاق, مناشف, سجاد, أرضية خشبية/باركيه, رف للملابس لإرضاء أكثر الضيوف تطلباً. إن قوارب, مسارات المشي, متنزه ترفيهي, تأجير معدات الرياضات المائية, الركمجة الشراعية هو المكان الأمثل في الفندق للاسترخاء وتفريغ طاقتك بعد نهار طويل. مهما كانت أسبابك لزيارة جولد كوست، فإن Chidori Court Apartments هو الخيار الأفضل لإقامة مثيرة وممتعة. Clean and roomy apartment, however, no lift available and had to walk 3 set of stair, quite awkward for family with small children. Stacey and George were amazing hosts from communicating prior to visit, to our entire stay. Clean and great sized appartments... the whole family from the US and NZ thoroughly enjoyed it. Cleanliness,ease of getting to restaurants and other locations. Really enjoyed our time and would stay here again. Wonderfully spacious apartment and the kids enjoyed the pool. Would definitely stay again! I booked a room for two for 8 days in Chidori Court apartment. It is very easy to located on GPS. Apartment was quite big with two bedrooms, one with a queen size bed and ensuite and one room with two single beds. There is an air conditioner in the sitting room and ceiling fans in the bedrooms. It has washing machine and a clothes dryer. Kitchen was well equipped with oven, fridge, electric cooker , dish washer and microwave. I did not do much cooking, only used the microwave oven few times. They provided a sachet for washing up liquid, one sachet for dish washer liquid and one sachet for laundry liquid. They suppled limited toiletries and they did not have housekeeping everyday. I asked for toilet rolls after five days as I did not want to buy packet of six toilet rolls in supermarket that I cannot finish, and the man at the counter told me it supposed to be a self contained unit, but he gave me the toilet rolls in the end which is very nice of him. 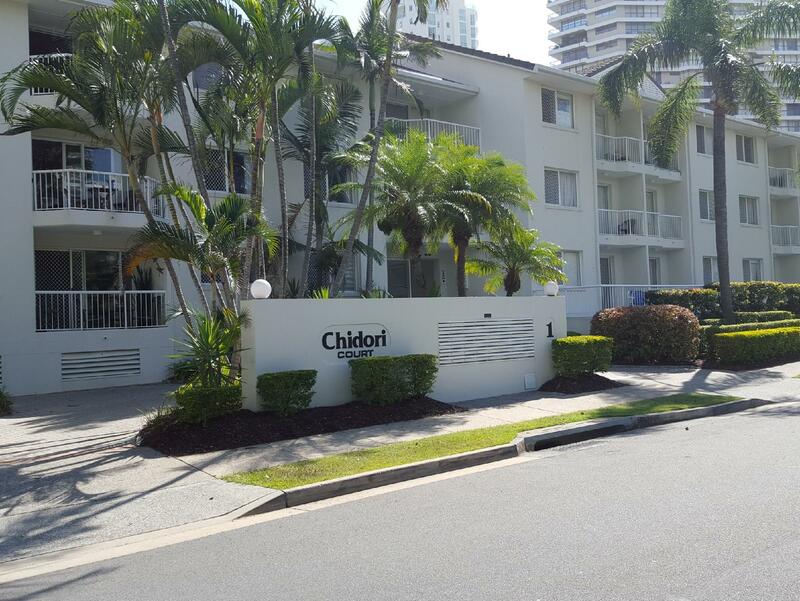 The place is near Gold Coast Highway, that leads to many places in Gold Coast or up north. Australian Fair is only less that 5 minutes drive, that you can do your shopping and eat there. It provided free Wifi in the unit, but only 1.5GB for 7 days which is not enough! My problem was I booked for 8 days via Agoda and the receptionist only had record of booking for 7 days, I went to clarify it and I forgot to ask him to extend the wifi. So the last day we did not have wifi in the unit and the reception was closed at 5 pm. On the whole it was a nice stay and most likely I will stay there again but will bring my own toiletries and toilet rolls. We were surprised at the location and facilities upon our arrival, everything a family needs at the best price I could find. Car parking is a bonus which is included in the price (one space). Security was also very good, locked gates and garage making us feel comfortable for our 12 year old to go to the pool as we watched from the balcony. Gardens were lovely and tidy. Pool and spa were clean and a real bonus for the kids. Facilities were great, kitchen a real bonus and 5 minute walk to local shops (supermarket very expensive! ), restaurants and bottle shop all close by. Having an ensuite wasnt expected and was great to have. The apartments arent marketed as 5 star so if you are expecting 5 star you may have a few small let downs but we loved it and will be back! Thank you! Comfortable with large spacious rooms,fully equipped kitchen and laundry. Great location. Value for money. great. if only we have free wifi for the kids, it will be better. Chidori Court is more like an apartment with nice environment and well equipped, suitable for family who like to cook. Every unit comes with a designated parking lot, the cleanliness within the premises is well kept and staffs there are friendly. Check in and check out process is fast and easy, the respond to any request is prompt. Unfortunately the pool is kinda small, but is good enough for kids to play around and also come with a nice bbq area for party.